Your group could help children to learn to surf through the Surfing Project in South Africa. Our sports projects can fit into the areas of expertise of you or your students. 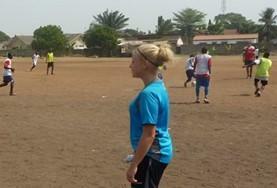 If you have a group of footballers they could go and work at a football academy in Ghana. If you have a group of hockey players they can help out in Argentina. If you have a group of sports leaders that want to go into schools and teach a range of sports that is also an option. There are a broad range of different options available depending on the areas of interest of your group. 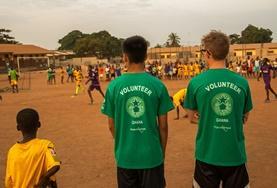 The volunteers don’t need to be experts in every sport as there will be local staff to support them on the ground. Immerse yourselves in the local community and enjoy an incredibly rewarding experience giving back to others and exploring a new environment. A group dress up in their football team uniform and pose for a photograph. Your group will be working with local youngsters alongside the staff. You can make a substantial difference to the children’s lives and development, by improving their football or rugby skills or introducing them to a new sport. You could be helping with a sports festival or supporting the PE department in a local school or keeping children from a local orphanage entertained. 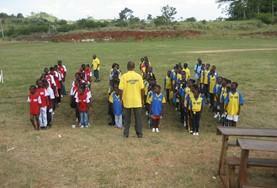 There will be lots of time to plan your activities which will be warmly welcomed by staff on the ground whether you are helping teach football in Ghana or cricket in Jamaica or another activity elsewhere. It is possible to combine a sports project alongside a local community project or Teaching Project. Volunteers from your group can work on a building programme in the morning and spend the afternoon helping coach on a Community Sports Project. 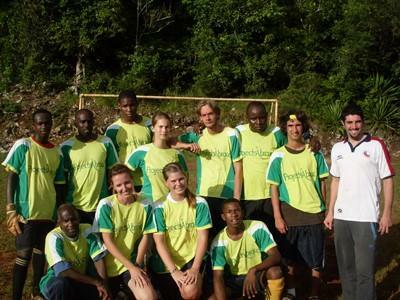 The group can spend the first week working on a Sports Project before joining a Conservation Project in the second week. There are endless combinations of projects that you could fit into your itinerary. We will organise a day to day itinerary to tie in with your group’s plans. If you want to combine projects get in touch and find out what is practical for your group to do. You can call us on 01903 708316 or email us at groups@projects-abroad.co.uk and we can put together a provisional itinerary for you. Projects Abroad have Sports Projects available in Argentina, Bolivia, China, Costa Rica, Ethiopia, Ghana, Jamaica, Kenya, Mexico, Mongolia, Morocco, Nepal, Peru, Romania, Senegal, South Africa, Sri Lanka, Tanzania, Togo and Vietnam.